The ArilSystem has been adapted into a compact piece of equipment for extracting pomegranate juice straight from the fruit. Available in several models, it can be used for commercial production or as an attractive counter-top addition for vendors offering glasses of tasty fresh juice to passersbys or diners, or for a restaurateur to offer a gourmet beverage to match the meal in up-market restaurants and hotels. The smaller models – Basic, Big Basic, Top and TopMaster, weigh 47kg and process 28 fruits per minute. The larger models, Master and FrigoMaster, weigh 102 kg and can process 45 fruits per minute. The fruit need only be clean – no cutting required. Just place a row of whole fruit in the diagonal fruit-feed arm, and within seconds the cup will be filled with fresh juice. The attractive design lets customers see the crucial parts of the story – whole fruit in, fresh juice out. Its rugged steel motor can be activated by turning on the tap, so that with one simple touch the juice begins to flow. 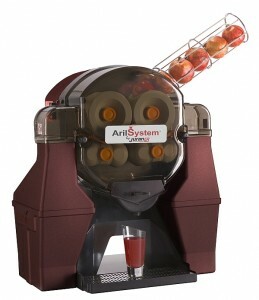 The fastest juicer on the market, ArilSystem juicers can produce up to 200 liters per hour. The juicer not only offers an attractive design, it is also ergonomically designed for convenient use, including such features as a splash guard to keep it attractive and clean, and an arched body allowing easy access for cleaning the cup platform. Its well-sealed design prevents any dirt or insects from entering the juicer, while its built-in internal self-cleaning shower feature saves maintenance time and bother. Since the ArilSystem separates the arils from all other fruit parts such as membranes and peels, the resulting juice has none of the bitter tannin taste that other juicers produce. The fresh pomegranate juice is a sweet and tangy taste of pure health. And although it was originally designed for pomegranates, the ArilSystem juicers do just as well with citrus fruit so that this one juicer can also provide orange juice, grapefruit juice, or lemonade. ArilSystem juicers have been installed in India, sold to leading US beverage companies, to Japanese restaurateurs, and many more.